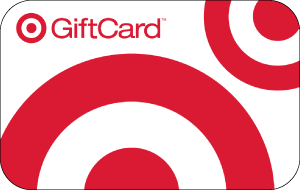 Redeemable for merchandise or services (other than gift cards and prepaid cards) at Target stores in the U.S. or Target.com, and cannot be redeemed for cash or credit except where required by law. No value until purchased. For balance information, visit Target.com/giftcards or call 1-800-544-2943. To replace the remaining value on a lost, stolen or damaged card with the original purchase receipt, call 1-800-544-2943. ©2018 Target Brands, Inc. The Bullseye Design, Target and Target GiftCards are registered tradem arks of Target Brands, Inc. Terms and conditions are applied to gift cards. Target is not a participating partner in or sponsor of this offer.